The Life of Calvin S. Mengel Jr.
Calvin S. Mengel, Jr., 85, of New Tripoli, formerly of Mertztown and Hamburg, died Monday, January 28, 2019, at 11:05 a.m. in Cornerstone Living, New Tripoli. He was the husband of Shirley M. (Ruppert) Mengel, Mertztown, they were married on December 8, 2003. His first wife, Shirley M. (Fegely) Mengel died February 1, 2000. Born in Windsor Township, Berks County, he was a son of the late Calvin J., Sr., and Naomi (Sunday) Mengel. Mr. Mengel was a member of Huffs Union Church, Alburtis. 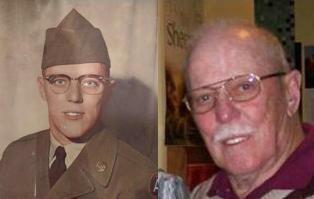 He honorably and faithfully served his country as a member of the United States Army during the Korean War. Calvin first worked as a heavy equipment operator for over 30 years at the former Ernst Construction, Hamburg. He then worked nearly 20 years as a welder for Carpenter Technology, Reading, until his retirement. Calvin was a member of Vaux Lodge 406, F.&A.M., Hamburg. He was a member of Ancient Accepted Scottish Rite Valley of Reading; and a member of Rajah Shrine. Calvin was an excellent fast-pitch softball pitcher, enjoyed gardening, helping on his parents farm, traveling far and wide with his first wife Shirley on bus trips to see country music stars, and spending time with his family. In addition to his wife of fifteen years, Shirley, Calvin is survived by a son, Kevin L., husband of Lori A. (Krammes) Mengel, Hamburg; and a daughter, Lori A., wife of Brian D. Potteiger, Temple. Other survivors include two sisters: Raelyn (Mengel) wife of John Mertz, Kutztown; and Mildred (Mengel) widow of Milton Shollenberger, Hamburg; brothers: Mylan Mengel and his wife Jean; Wayne Mengel; and Charles Mengel and his wife Betty, all of Hamburg. There are six grandchildren: Cory S. Mengel, Shelby L. Bowen, Brent D. Potteiger, Dr. Shawn M. Potteiger, D.O., Kirstie C. Croft and Aubrie R. Potteiger; and twelve great grandchildren: Kaitlyn Mengel, Brianna Mengel, Noelle Bowen, Cameron Bowen, Frances, Potteiger, Augustine Potteiger, Bernard Potteiger, Jerome Potteiger, Gerard Potteiger, Anthony Potteiger, Philomena Potteiger and Annamae Croft. In addition to his first wife Shirley M. (Fegely) Mengel, Calvin was predeceased by two sisters: Ruth (Mengel) Heckman and Elva (Mengel) Hartman; and two brothers: Lester Mengel and Roy Mengel. Funeral services to celebrate Calvin's life will be held on Saturday, February 2, 2019, at 10:30 a.m. from Ludwick Funeral Homes, Inc., 333 Greenwich Street, Kutztown, with Reverend Jane M. Kropa, officiating. Interment with military honors provided by Ray A. Master American Legion Honor Guard, Topton, and PA Military Honors Group, in Zion Moselem Church Cemetery, Kutztown. Relatives and friends may call on Saturday from 9:00 - 10:30 a.m. in the funeral home. The family requests contributions be made in Calvin's memory to American Diabetes Association, 2451 Crystal Drive, Suite 900, Arlington, VA 22202 or on line at www.diabetes.org. Ludwick Funeral Homes, Inc., Kutztown, is in charge of arrangements. Memories and condolences may be shared at www.ludwickfh.com. Please share your memories of Calvin.